We focused on the cellular mechanisms underlying synchronous neuronal activities in the hippocampus. By studying an in vitro model of hippocampal gamma (30-40 Hz) oscillations, we found that the rhythmic changes in local field potentials are generated by the precisely timed discharge of pyramidal neurons and fast spiking basket cells. The discharge of pyramidal cells is primarily controlled by synaptic inhibition, while excitatory input drives the firing of inhibitory cells. We currently investigate the synaptic mechanisms underlying the generation of sharp wave –ripple oscillations that emerge spontaneously in hippocampal slices. We found that the same microcircuits composed of the pyramidal cells and fast spiking basket cells play the crucial role in the generation of these high frequency synchronous activities. 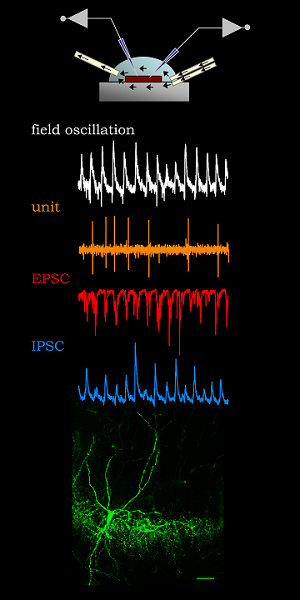 We aim to understand the necessary circuit properties, which make the same hippocampal network to generate two distinct types of network oscillations. 30 mySQL queries in 0.906 seconds.